As the only climbing gym in New River Valley, Crimper’s Climbing Gym has become a Southwest Virginia haven for novices and climbing masters alike to enjoy the challenge, fun and exercise of indoor rock climbing. The gym, operated by John Johnson since 2012, will continue to be an asset to its community thanks in part to financing from Virginia Community Capital. 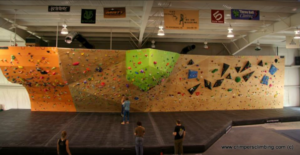 Crimper’s offers a world-class bouldering area, top-roping, leading climbing and a large training area. In addition to offering classes for climbers to strengthen their skills in the complex sport of climbing, the gym is a source for joy and development for youth, with team-building programs, workshops, birthday celebrations and overnight events. VCC’s loan refinancing helped Crimper’s retain 10 jobs while keeping its location for another decade. The project used conventional commercial real estate financing (10-year term, 25-year amortization) that allowed the company to comfortably spread out its financial obligations, so that it could continue to prosper, retain staff and keep the family-friendly facility that patrons have come to love. Funding for Crimper’s Climbing relied on VCC’s attention to detail and ability to adapt to the needs of our client and structure a refinancing plan that best suited our client. We recognized and were successful in providing the business the funding it needed to meet its goals. VCC values businesses like Crimper’s Climbing Gym that are important to their communities, and we work with them on a personal level to help them continue to thrive. VCC has a mission to help businesses in underserved markets, and the Crimper’s Climbing loan was a perfect fit for our model.